I have taught baptismal preparation many times, in several places. I never considered this sentence to be the most pertinent question in our baptismal liturgy. More consuming to families, and in my teaching, was the promise to teach and model Christian faith for the child. Indeed, often I considered baptismal preparation to be offering a refresher course in Christian theology, spiritual parenting (even before I was a parent), and Episcopal liturgy. After all, many families had not considered church since the celebratory cake following their confirmation (to be clear, I was once in this camp too). I didn’t really consider what the ‘full stature of Christ’ meant until my own son’s birth. 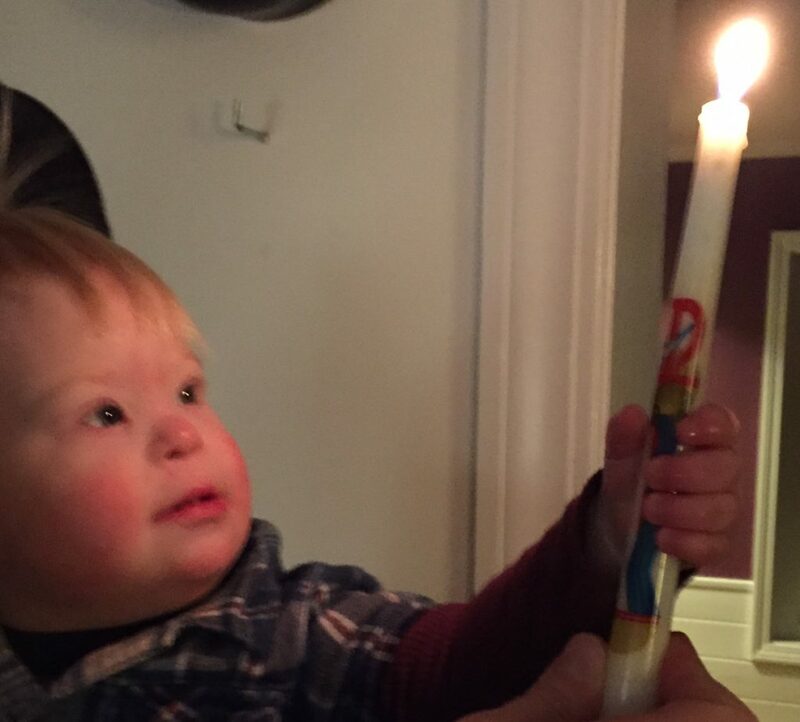 My son, Jack, was born with Trisomy 21, commonly known as Down syndrome. We had not expected a child with special needs. My husband and I had discussed how we might respond should our children ever have health or developmental issues. We quickly realized that theoretical discussions and decisions made looking into the face of a newborn with oddly shaped eyes and an inevitable ceiling of capabilities are two profoundly different things. As we held our child in our arms those first few days, we grieved. We grieved because the child we held, and the child we imagined having, were, and would be, two different people. Nurses and doctors and Down syndrome advocates gently reminded us that love would never be a challenge for our child. Happiness would never be far from him. That he would be gentle and unique. And he is. Jack is absolutely himself, and his grace beams into hearts of differing permeabilities with shocking acumen. But those first days, we did not want a child who would only be known for his love and gentleness. As we spoke to each other in the curtained nook of the Special Care Unit, my husband and I told each other of the hopes we had each cherished, the attributes we had held so closely and as our ideal. As our descriptions rolled out, we found that what we had hoped for was entirely about our own egos. Our hopes had centered on our concern for the ease of his life, and our own. We wished for wit and intelligence; success and coordination; scholarship and kindness. But as I read again and again that one question from our baptismal liturgy about helping my child grow into the full stature of Christ, my hopes and my faith seemed to nudge each other in tension. It wasn’t about my child’s abilities. It was about my own reluctance—even as a Christian, even as a priest—to value and honor a life devoted to service, humility, reconciliation and love in its purest, least showy, least valued form. I’ve often wondered at the spiritual practice of parenting—welcoming in a small, needy stranger into our home, hearts and bodies, accepting them with their gifts as is, making ‘come as you are’ not simply a catchy welcome to worship, but a daily reality. In our baptismal vows, for us, and for these smaller strangers, we are called again and again to dive into what the depths of love can look like. It is love which is not dependent on worldly success. It is life which is not dependent on the admiration of others. It is spirit which seeks God’s presence in the world, and in one another. Our son’s gifts will bring God glory in their own ways, in their own times. He has already brought God’s love and presence closer to our family, and transformed our hearts irrevocably. He has changed his mama-priest’s baptismal preparation in her congregation for the better. I vowed to help my son grow into the full stature of Christ at his baptism. I had no idea at that time that he would be doing the same, and more, for me. Who helps you discover what it means to grow into the full stature of Christ? Thank you so much, Kit, for sharing this story with us and giving us a little glimpse of life with the amazing Jack. I love the idea co-teaching and co-leading each other into the full stature of Christ. Thank you, Kit. I have shared your beautiful message about your precious Jack. We are so lucky to have you at Esperanza. On a personal note, you are truly one of the finest priests I have ever known. Thank you for this beautiful, moving, personal testimony! It calls me to re-assess my thinking as a parent, teacher, and follower of Christ. Thank you for a lovely reflection. It meant a lot to me today. Thanks for this beautiful testimony, Kit. The photo is just gorgeous. This is very good and I love how much you love your son and how you’ve learned to meet the baptismal vows. But, as an adult with a disability, I really wish you wouldn’t use the term “special needs,” when what you really mean is that your child has a disability, which has a name: Down’s Syndrome. Your child’s needs aren’t any different than anyone else’s. They may take more and different effort to meet, but they are the same needs any person has. Just want to give you perspective from an adult with a disability who finds the term “special needs” to have an othering quality to it. Kit, I just read this post on the St. John’s Charlestown News and Notes. Thank you for your honesty and humility—and for Jack whose face and candle illuminate the world with the light of Christ. How beautiful and reflective your words are Kit. Privledged and abundantly blessed to know you and Jack. Which of us is not a child of God with special needs? I know I am,and am grateful those needs are met every day by God and encouraged and strengthened by your words. Times change and with it the profound meaning of words change with them. Respectfully we remember both the past and present.